Pope Francis met with the father of Kristel Padasas, the 27-year old volunteer who died at mass in Tacloban the day before when he visit the city devestated just over a year ago by killer typhoon Haiyan. Padasas was fatally injured when scaffolding by the stage where the mass took place collapsed during the wind caused by the tropical storm approaching the area, Vatican Radio reports. Pope Francis had held an open air mass in the Philippine city of Tacloban, which was devastated by Typhoon Haiyan. The pontiff was forced to cut short his visit due to another storm blowing in and his mass the following day in Manila was also buffeted by the powerful weather. 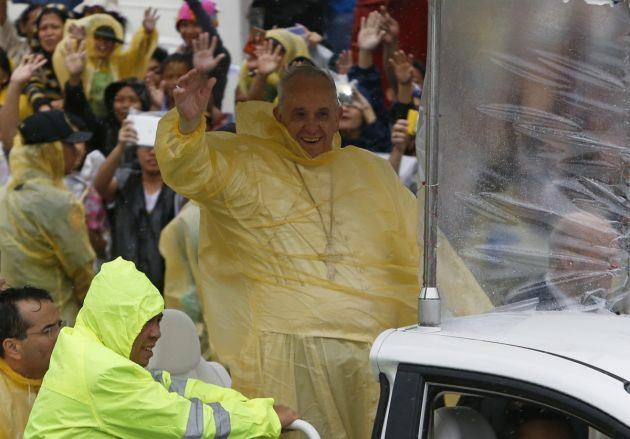 Tens of thousands braved pouring rain and strong winds brought by Tropical Storm Mekkhala to attend the mass in Tacloban said by the Pope wearing a cheap yellow rain poncho, the same as worn by the crowd. He was due to meet survivors of the typhoon after the mass but the storm forced the Pope to cut short his visit otherwise he may have been stranded in Tacloban. A 12-year-old girl wept as she asked Francis why children, in particular, suffer so much, The Associated Press reported. She spoke of children abandoned by their parents who end up in prostitution, but could not get through her remarks. "Why is God allowing something like this to happen, even to innocent children?" she said through tears. "And why are there so few who are helping us?" Francis was clearly moved, but said he had no answer. "Only when we are able to cry are we able to come close to responding to your question," he said. "Those on the margins cry. Those who have fallen by the wayside cry. Those who are discarded cry," he said. "But those who are living a life that is more or less without need, we don't know how to cry." Sunday's meeting with the killed woman's father took place in the Apostolic Nunciature in Manila, and lasted over 20 minutes on January 18, with Cardinal Luis Antonio Tagle acting as an interpreter. The director of the Holy See Press Office, Father Federico Lombardi, said during the meeting, two childhood photos of Kristen were on the table. He also said the father was shocked by his daughter's death, but consoled by the fact that she had been able to help prepare for the arrival of the Pope. Kristel's mother was in Hong Kong at the time of the accident, and was due back in the Philippines on January 19. During his Sunday meeting with young people, Pope Francis led a prayer for Kristel and her parents. 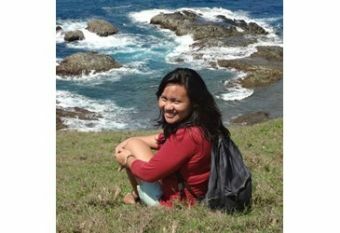 Kristel worked for the U.S. bishops' international relief and development agency, Catholic Relief Services, on a recovery project for Typhoon Yolanda [Haiyan]. "Her dedication to the people affected by the typhoon extended beyond her official work with CRS," the organization said in a statement. "She traveled a great distance to volunteer at today's papal mass and to remember the victims of Typhoon Haiyan." The statement also said CRS Philippines mourns her loss along with her family, friends and loved ones. "[Kristel] colleagues remember her as someone who loved to laugh and who was always ready to assist outside her normal duties," it continues. "She found great joy in being able to contribute to the recovery effort by working directly with communities and families. Our deepest prayers are with Kristel's family and loved ones."